Have you ever wondered how would it be to have a superpower within you? Not the fantasy world of Wolvervine like Claws or princess magic power , but a superpower which is real and achievable . Read on to know more! Have you ever wondered how would it be to have a superpower within you? Now, before you start to imagine super strong muscular power with claws like Wolverine or even Disney princess like gorgeousness with magical powers , let me be clear that the kind of power I am referring to is not in fantasy but is achievable in real world! And that is exceptional brain power! The kind of power that lets you eliminate fear, face uncertainty and develop such a high level of mental toughness that you will be able to deal with any challenge your business or life throws at you! With this kind of power, your goals are achievable, and success is within your reach! This kind of brain power is exhibited by trained snipers who form the elite and toughest section within the military. Snipers undergo rigorous physical, psychological, mental and technical training which makes them exceptional at their task. They are a complex fusion of both hard skills like weapons knowledge, knowledge of ballistics and physics as well as soft skills like emotional stability, empathy and calm acceptance of hardships involved in the job. The Best-Selling book “Sniper Mind” is unique in concept as it explores the various military techniques used by snipers and correlates to real world scenario offering practical concrete strategies to implement increasing focus, decision making abilities and achieve your goals in a superhuman precise and calculated way. Ash: Can you tell us your backstory — about your work before you became an Author. David: I studied Chemical Engineering and, when I traveled from Australia to Europe I started travel writing, initially, and then technical journalism. I became a journalist after University joining The European and from there in 1995, I became a corporate communications manager for a large national retailer in the United Kingdom. Prior to that I was writing about the internet, search and SEO and these were skills I honed in a real, live retail environment until 2002. Leaving that job, I joined a few boutique studios as an SEO manager. I traveled around every opportunity I could get. In 2010 I brought out my first technical book (SEO Help) and it became an instant hit. There was nothing around at the time to demystify SEO. Things escalated from there as they say. The subjects I write about these days are the web, social media, marketing, search and now, with “The Sniper Mind” the brain and how we think. The twin threads running through all these subjects are demystification and optimization. I strive to give my readers the simplest in, in complex subjects with practical take always they can implement that will help them change their lives and improve their business. Ash: Give us a background of how this book idea came about and what inspired you to write this book? David: It started out as an article on Forbes and it got half a million views very quickly. My agent then wondered if there was a book in that. I am usually reticent to develop a book from a single article; the content tends to be thin and not very engaging. I investigated it however and there was a whole lot of new research coming out and neuroscience was developing all these new tools and suddenly all these different pieces started to fall into place. It took three years, hundreds of interviews and a whole lot of sleepless nights to make the book happen. Ash: How is this book different from any other self-improvement books that are currently available? David: A lot of self-improvement books hit the right notes and give you something practical to do that is quite prescriptive. If we have learnt anything at all the past five years is that we are all unique in our neural and psychosomatic make up. I crafted “The Sniper Mind” to show the practical examples, reveal the science underneath and then link up with the practical aspects of it but I have left it to the reader to customize to what he or she feels is required of them. When it comes to self-improvement each of us is at different points of the same shared journey. It was important to me to provide a book that would become a launch platform for the reader, providing the tools needed to go higher, think better and become more capable on their own terms not on some presupposed perception of them created by me. This makes “The Sniper Mind” a little harder to read at times. Readers have emailed me to tell me they are stuck on a chapter or they are unsure about what they’ve understood, and I think that this is brilliant. A book that makes us think, changes our thinking. Changed thinking leads to a different perception of everything. We need to start perceiving the world differently if we are to solve all the different issues that come up in relation with it. Case in point, just today I was reading a Rand article that said how the speed at which everything happens is a major challenge to every decision maker in every area of human performance. That’s all of us then. We all need to start using our brains better. Ash: Any specific moment you want to share about your life that ignited the spark within you and provided momentum needed to write the book? David: I suppose looking back you can say I, like everyone else, have always wanted to know how to be mentally better. More aware. More focused and more motivated. Way back when I was at school I read Frank Herbert’s Dune (and the subsequent volumes of his misnamed ‘trilogy’). In that universe humans are valuable because they develop themselves into an incredibly skilled resource. I wrote a piece about it connecting the dots for today’s marketers and entrepreneurs. This century, as automation and AI take off, the real valuable skills lie in being more human though, obviously, a trained one. Ash: How did you connect the dots between sniper thinking and self-improvement? David: The initial aspect of this is easy. The phenomenon that psychologists call “transfer” allows for the brain to learn to do something difficult in one part of life and then transfer that knowledge in another that is quite different. The easiest example of this is when we learn to do something in a simulation. But the concept holds true for even more removed activities. Playing a multiplayer online video game helps us develop better situation analysis skills, team work and judgment calls. It helps us prioritize, deal with pressure and have better emotional control. The brain doesn’t have separate neural circuits for playing video games and making complex decisions, under pressure in real life. It uses the same skills, but we need to be able to consciously apply them. Of course, I went digging deeper. I looked for outliers in sports and business and looked through historical accounts of baseball for ‘anomalies’ instances when players should have lost but won. Cases where games were won when no one expected them to. There is a deeper, underlying story of neural performance in each case. I dug up enough material for two books. Writing this one, the scope and depth kept expanding. I was three months late handing it in and my editor had to gently remind me that there is a timeline for publication. Ash: Correlation between snipers and their mindset in the battlefield and applying those techniques in a workplace setting within our modern society full of digital distractions is somewhat of an unique comparison — tell me your thought process through writing, research and publishing your work. David: Snipers are capable of performing incredible feats under the most horrifying, pressured, stressful conditions. Variations in their heartbeat, a slightly harder pull on the trigger due to stress or emotion can make them miss. But beyond shooting at a target they have to perform like complex semantic search engines, they look at everything they see and work out its contextual value and its relational strength compared to everything else. They can do that irrespective of everything else happening around them. Such an ability to focus is an incredible superpower to have. If we could learn to apply it in a business setting we’d be incredibly productive and also, able to direct our activities in ways that better ensure the outcome of the things we do. Ash: Am curious to hear your experience interviewing snipers for your research. Could you share your experience? David: Yeah, that actually is fascinating. Rather naively in my search for snipers I turned to the web first. I put out a call on imgur and the reaction I got back was both amusing and a little dispiriting. I then turned to my publicist who knew someone with military background and that provided the first few referrals and from those I got a few more and then a few more. It sort of cascaded. But the hardest part was to get snipers to trust me and open up to talk about their experiences and answer my questions. It would usually take at least one Skype meeting where I’d explain the context of my work and then lots and lots of emails going back and forth plus a questionnaire I had them all answer. What I found fascinating was that I could better understand and contextualize the skills they had than they did. Once I told them the context and the neuroscience behind it, obviously, they were a natural because these are skills they all have honed. They are focused, analytical, observant, methodical. They have incredible resilience and self-control, a strong work ethic and unshakable self-belief and sometimes they’d struggle to articulate these skills or even see how they could be put to good use. Armed conflict is a horrible experience. Those who’d served tours in places like Afghanistan or Iraq had kind of locked the entire experience and their skillset with it somewhere deep inside. There were exceptions of course. There are snipers I interviewed who have made the transition to civilian life smoothly. All of them were quiet, displaying a sense of humility that I found humbling. Ash: What kind of professionals would benefit the most out of your book? David: I am tempted to say everyone because this is a book about self-improvement and on that score, we are all at different points of the same shared journey. Obviously, anyone who is an entrepreneur, deals with critical decision making, wants to know how to build resilience and juggle all the various factors that make up working life or, I should say, life today, would benefit from this book directly. Ash: Tell me about your journey so far as an Author and how has this process transformed you? David: I consciously engage a lot in social media and try to be as responsive as possible to those who interact with my posts or respond to a Tweet or engage with my writing on the web. The process has transformed writing for me significantly. I am more in tune with my readers than ever before and, these days, I share a lot of my research and writing as I go along when working on a book and this has transformed what is essentially a lonely, solitary activity to something a lot more communal and collective. I feel this has made me a better writer, way less self-indulgent and has, hopefully, raised the value of my books to my readers. Ash: And lastly, can you share just one major takeaway from the “Sniper Mind” for your readers, what would that be? David: There are so many but the most self-transforming one is be empathetic. Empathy changes the way our brains process our reality which means that reality itself changes for us as a result. Favorite Author: I love reading and there are many — Frank Herbert for the impact of his vision on me. Advice to other aspiring writers: Be true to you. If you want to find readers, you need to deliver value. To do that you need to mine what is core to you. Understand that and then everything else will fall in place. Advice to younger self: Let the anger go. It only holds you back. 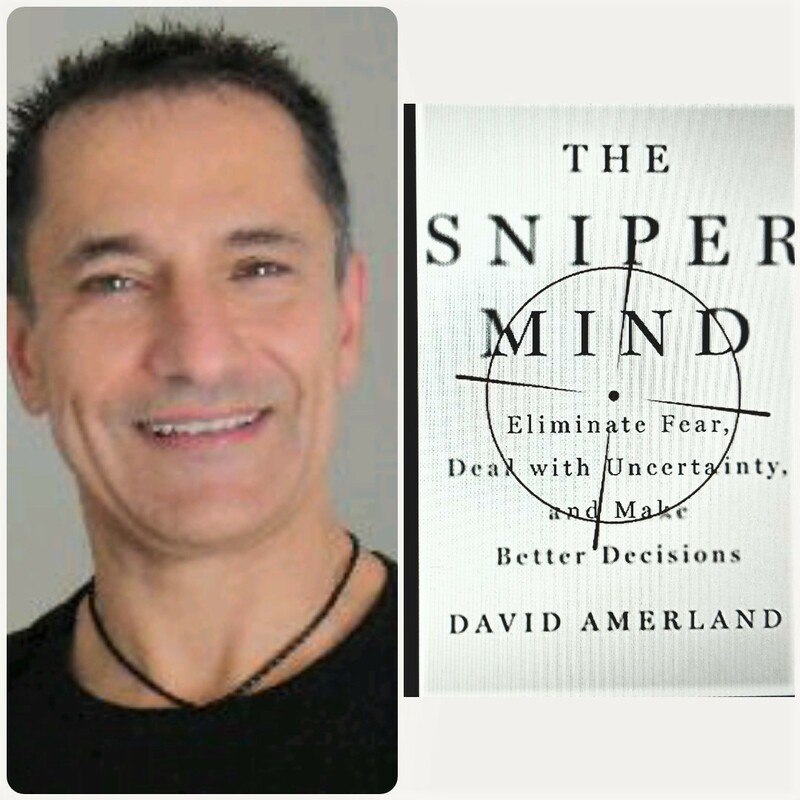 I wish to Thank David Amerland for connecting with me and taking the time to provide insight into his Author journey and all about what “Sniper Mind” has to offer to every reader who strives to get better at life, work or relationships. You can get in touch with the Author, HERE! Grab a copy of the Sniper Mind, HERE! Ash Rao is a global talent acquisition expert at Verizon, as well as a certified career coach whose insights have appeared in ThriveGlobal and Social Hire. You can connect with Ash at her blog and on Twitter or LinkedIn.